As an icon of creativity, the stereotype of the tortured artist—both burdened and blessed with innate, outsized talent—has been disrupted. Creativity is no longer the sole property of the artistic elite. As our understanding of what defines a creative person expands, we have come to identify creativity as an essential aspect of professional life. The benefits of promoting creativity among employees—better job satisfaction, improved problem-solving skills, increased productivity, etc.—are well-documented. So, let’s instead explore how business leaders are fostering creativity through workspace design and company culture in our community. Ban the phrase: "I'm not creative"
Promoting creativity starts with redefining what creativity is. “When people use the word creativity, I think they tend to be thinking about art,” says Greg Brokaw, managing partner at Rowell Brokaw Architects. “Creativity is also just the day-in and day-out problem-solving we do on all different levels.” Humans are natural problem-solvers, therefore we are all creative. ​Both the City and Isler CPA consider their travel time to reduce their carbon consumption, using the digital age to their advantage between meeting with clients, teaching classes, and delivering briefs. “I think that any space that’s designed for creativity has to have a blank canvas sort of feel to it,” says Brokaw, whose firm’s work for a variety of clients consists of designing such spaces. Rowell Brokaw’s own office features neutral, clean design that supports the creative process without distracting from it. “A big part of my job is to create a space that makes people feel motivated, empowered and inspired to be here,” says Murray of Eugene Mindworks. One way she achieves this is by adding features that humans crave, including natural light via large skylights and abundant plants and greenery. With the right combination of culture and thoughtful design, any company can create a work environment that promotes creativity and enjoy all the benefits that go with it. When it comes to designing creative workspaces, Aliotti emphasizes an empathetic approach: “Think about what the environment looks like when you’ve been able to be your most creative self,” she says. 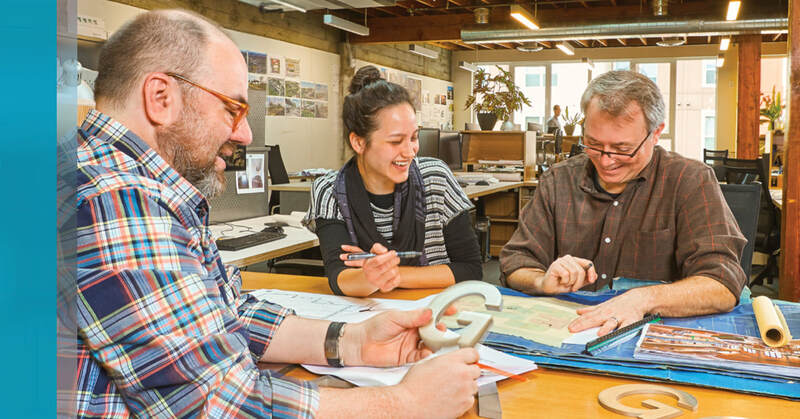 “You nourish creativity in your staff by allowing them to have a lot of freedom and responsibility.” - Greg Brokaw, Managing Partner, Rowell Brokaw Architects.